Madeleine de Scudéry (1607-1701) was the most popular novelist in her time, read in French in volume installments all over Europe and translated into English, German, Italian, and even Arabic. But she was also a charismatic figure in French salon culture, a woman who supported herself through her writing and defended women’s education. She was the first woman to be honored by the French Academy, and she earned a pension from Louis XIV for her writing. 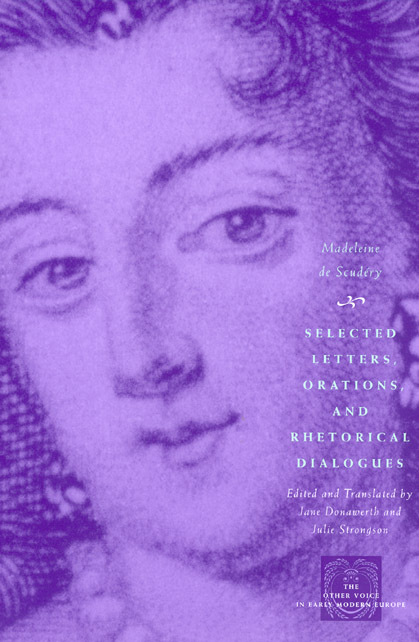 Selected Letters, Orations, and Rhetorical Dialogues is a careful selection of Scudéry’s shorter writings, emphasizing her abilities as a rhetorical theorist, orator, essayist, and letter writer. It provides the first English translations of some of Scudéry’s Amorous Letters, only recently identified as her work, as well as selections from her Famous Women, or Heroic Speeches, and her series of Conversations. The book will be of great interest to scholars of the history of rhetoric, French literature, and women’s studies.